*The Disney Dining Show publishes reviews of meals that we pay for. We only utilize discounts and offers if they are available to the general public, such as annual passholder discounts and Tables in Wonderland membership. We receive no outside compensation for our dining experiences so that we may give our honest opinions about price and value. On May 2, 2018, myself, Charles Boda, Pete Werner, and two Dis Unplugged podcast listeners had the opportunity to have dinner at ‘Ohana, the all-you-care-to-eat feast at Disney’s Polynesian Village Resort. This restaurant is beloved by many, but recently it has had several bad reviews on the disboards, so our purpose of visiting was to go investigate. As you walk into the restaurant, a host or hostess picks up your hot Pineapple-Coconut Bread and then proceeds to bring you to your table. Our hostess was nice and welcoming. We did find it a bit odd that our hostess only picked up one small loaf of the bread, and that we had to insist that with five grown men we’d need more than just one. That being said, once we made that recommendation she was very accommodating. The bread itself was delicious. I had to stop myself from eating more bread because I was worried about getting full before the appetizers and entrées came out. 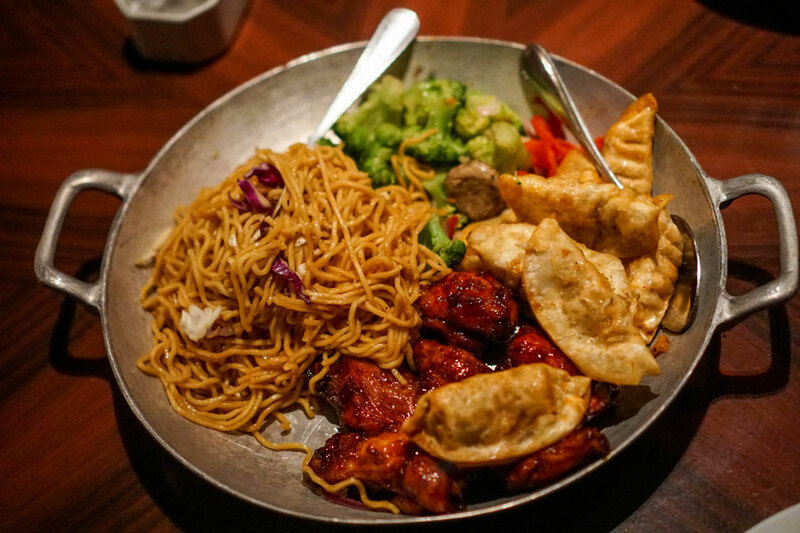 Next you meet your waiter, who takes your drink orders and then brings the table Yakisoba Noodles, Pork Dumplings, Honey-Coriander Chicken Wings, and broccoli. While our waiter wasn’t outwardly rude, he wasn’t going out of his way to give us the top-notch service you’d expect at Walt Disney World. The appetizers were great, especially the Pork Dumplings. I could have honestly had just the Pork Dumplings for dinner because I love them so much — they have the perfect amount of crispiness. The Honey-Coriander Chicken Wings also have a delicious glaze on them, but I don’t enjoy the drumstick wings as much as the flat wings. Unfortunately for me, we were served mostly drumstick wings. I won’t knock ‘Ohana for that, because some prefer the drumstick wings, but it was just my luck. The Yakisoba Noodles were good, but they were certainly not the crowning jewel of the meal; in fact, they aren’t memorable at all. Lastly, the broccoli was, well, broccoli — not really a lot to say about it. 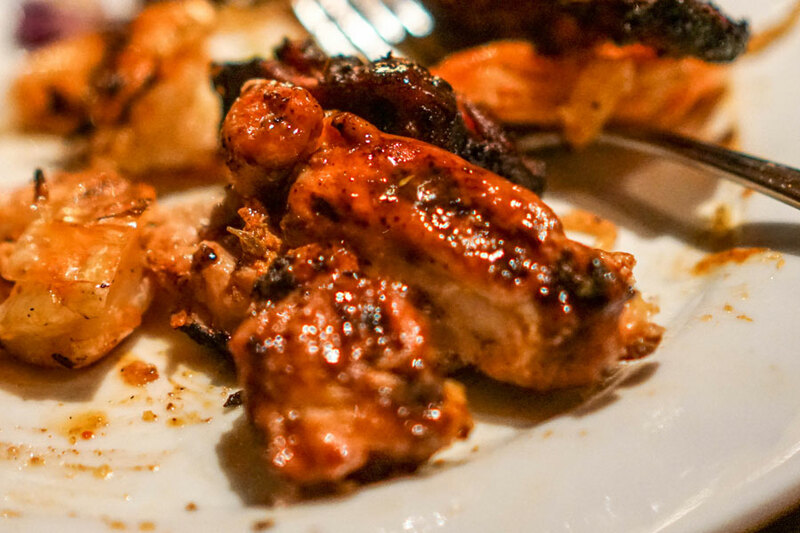 After you finish your appetizers, servers come in rounds to your table with skewers of Sweet-n-Sour Chicken, Spicy Grilled Peel-n-Eat Shrimp, and Szechuan Sirloin Steak. Everything here was so good! The Szechuan Sirloin Steak was my favorite, but I enjoyed them all. This is where the meal went wrong though. Typically, the servers come in rounds, serving you these three options until you are full; in our case, they only came once. 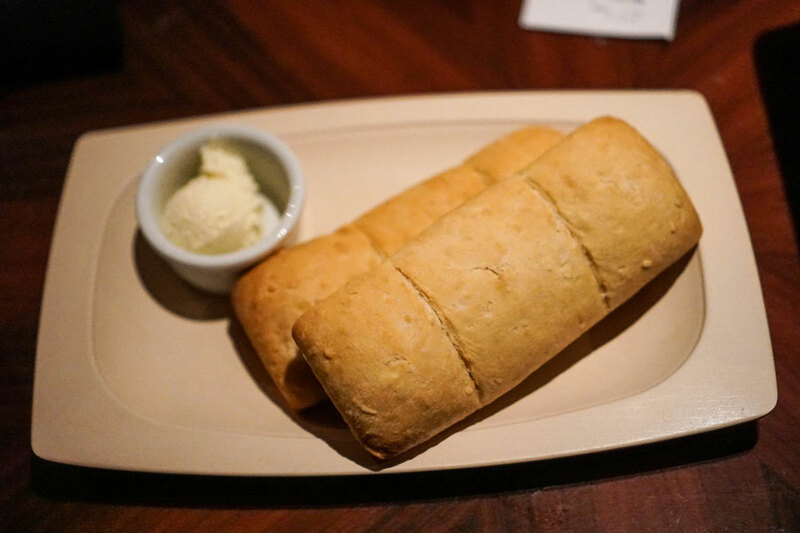 At previous dinners at ‘Ohana I had the servers visit the table three, even four times, but on our visit, the dessert was on the table after only one round of meats and shrimp. I had been eating my entire meal trying to save room for the massive amount of steak I was planning on eating, but I didn’t have that opportunity, and this left me feeling incredibly disappointed. 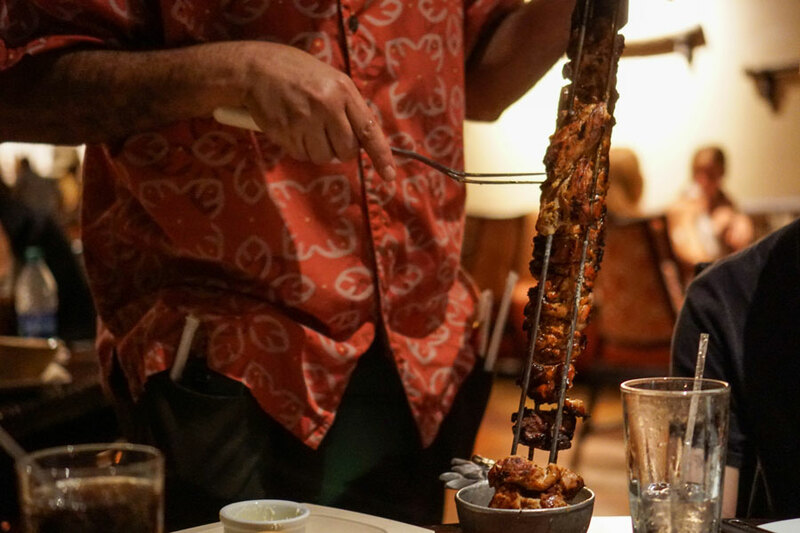 It is hard to give ‘Ohana rave reviews right now, because for how expensive it is, they barely feed you — at what should be an all-you-care-to-eat meal. 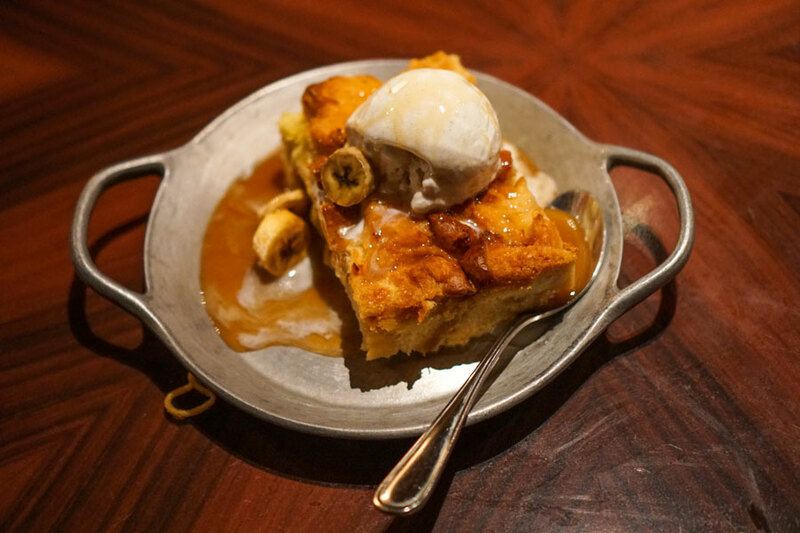 The meal concluded with a Bread Pudding, and it was delicious. I have never had as much of it as I did during this particular meal because I am usually too full. So, I guess that was the silver lining on not being fed as much during the entrée portion of the dinner. It is hard to give ‘Ohana a fair review because, on one hand, everything was delicious; on the other, the lack of our server’s presence at our table (and the absence of the steak, chicken, and shrimp returning in rounds) really left me feeling disappointed with what would have been a great meal. Feeling rushed at a restaurant that costs $60 per adult leaves a bad taste in your mouth. So while I would have liked to give ‘Ohana a 9 or 10 out of 10, I am going say that, overall, my experience was only a 7 out of 10.